After getting utterly disappointed with The Killing Joke, I was reluctant to read another hyped Batman story. 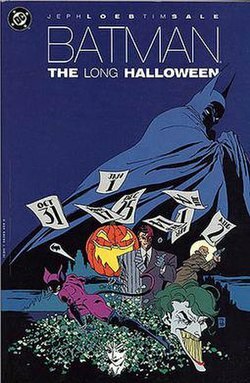 Thankfully, Batman: The Long Halloween exceeded all my expectations, becoming an instant favorite. If, like me, you’ve enjoyed Christopher Nolan’s Batman trilogy, then I recommend you read this comic. You’re sure to see how strongly it influenced the actors’ portrayals, particularly Gary Oldman as Jim Gordon. And if, like me, your favorite film in the franchise is The Dark Knight, then you’ll really love this. Granted, it’s more of a mob story than of a Joker story, but they both deal with the same issue: that those in pursuit of justice can, in their relentless zeal, descend into the same lawlessness as those they are trying to apprehend. In TLH, Gotham City is controlled by the powerful mob boss Carmine “The Roman” Falcone. Batman, Jim Gordon, and District Attorney Harvey Dent make a pact to “bend the rules, but never break them” in order to end Falcone’s criminal reign. But it seems that they’re not the only ones who want to bring the crime family down. On Halloween, The Roman’s nephew was found shot in the head. It marked the beginning of a murder spree by the so-called Holiday, who proceeds to kill mob members on holidays. Batman has his work cut out for him: not only does he have to bring down the mob that’s completely overtaken Gotham, he also has to uncover Holiday’s identity. And there’s no shortage of suspects: could Holiday be Sal Maroni, Falcone’s rival for criminal control over Gotham? Or Dent, whose zeal for justice may go to extremes? Or even Bruce Wayne, who, it is discovered, has a connection to the Falcone family that stems from his parents? Jeph Loeb, the writer, laid the entire plot out so well that no character is there by chance. Every one of them plays a part in shaping the story and adding to its depth, and no single character—not even Batman—was given too much exposure. This 13-issue series showcases the tense dynamics among Gordon, Dent, and Batman: steadfast men who are unwilling to yield to injustice, and whose personal lives are caught in the crossfire by the demanding, dangerous nature of their jobs. Gordon, as the honest, by-the-books cop who, even in times of crisis, is none too eager to team up with a vigilante, is the perfect foil to Dent’s rougher approach to crime. The depiction of Bruce Wayne as more than just the Caped Crusader’s alter ego made him a far more interesting character here, as compared to other Batman comics where Bruce’s only role is to put on a tuxedo and rush off to the Batcave. As the series progresses, we begin to wonder just how much these men are willing to sacrifice—and to what extremes they might go—in order to take Gotham City back from the evil that has overtaken it. Apart from the Falcones and the Maronis, TLH is a certifiable Who’s Who of the Rogues Gallery, with appearances from infamous supervillains like The Joker and Poison Ivy to the lesser-known criminals like The Calendar Man (a key character here). I like how they never steal the spotlight from the story, which is a feat considering it would be only too easy to let these established villains take over the show. I am really pleased to say that Loeb didn’t overdo it with The Joker’s appearance. Such an iconic character would only be too easy to overexpose, but his role in this series is minor1. A great comic = good writing + good art2. TLH just wouldn’t have been the same without Tim Sale’s art: sharp, dramatic, and gritty. The use of shadows and lighting gave the comic a mobster film-feel. The predominant use of black and white evokes a dark, somber mood fitting the story. There were also entire scenes done in greyscale with the highlight of a single object colored in.3 I loved going over and over each panel and noting how color was used to convey certain emotions or themes. Gregory Wright, the colorist, has phenomenal work done here. TLH is an addicting read that is capable of sustaining interest and engaging the reader. The plot twists are convincing enough to not feel contrived, and any fan of whodunnits will love putting the clues together. You don’t even have to be a Batman fan to appreciate it for the excellent mystery that it is.